I'm what's called a "Newbie" to blogging. I love blogging about my crafting and have met some wonderful people out in Blogland. The blogging community is an awesome group! So creative and lovable. I came across a post by my friend Danni, whom I found through blogging. When she sees something she likes, she becomes the biggest cheerleader for that cause. Through her posting, Danni convinced me to participate in the Christmas Mug Swap sponsored by Heather @ Heatherly Loves. As a newbie, this is a great way to meet other bloggers and share interests. I found the nicest person, Sandra @ Beneath this Roof, Within these Walls who received the mug that I sent out. After getting my mug, Sandra sent me a lovely email about herself and I realized we have a lot in common. We now follow one another and share emails from time to time. I was so excited when the mail lady rang the doorbell and had my "mug package" in her arms. It was so cutely decorated! Inside, not one, but TWO mugs! Kim@solaceamidthechaos.blogspot.com really went overboard in her selections. How beautiful! 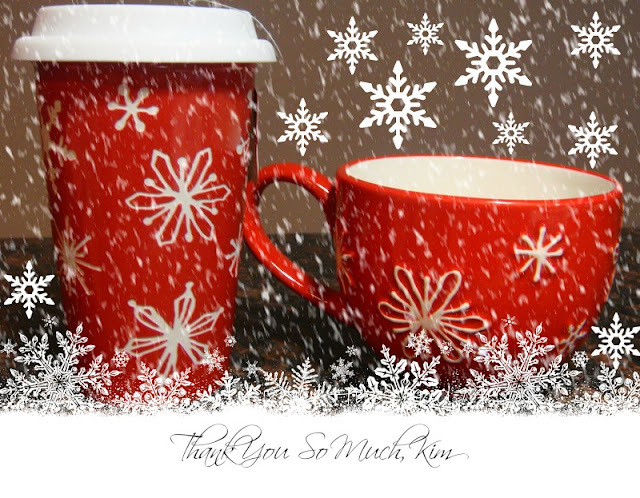 The mugs, one thermal for traveling, and the other, for home, are hand painted ceramic, embossed snowflakes by St. Nicholas Square. There was also a very nice note saying she hoped I enjoy the mugs and how she loved them so much that she wanted a set, too. How adorable! I hadn't seen Kim's blog before and immediately checked it out. She doesn't blog often, but she has some wonderful posts. She does some amazing flowers with duct tape, so please give her a visit. I am now following her! I'm so glad to meet you, Kim, and thank you again for the beautiful mugs. I participated because of Danni, too! Gail, you received a dynamic duo of mugs! Isn't it nice to make new blog friends? I got two new friends from the mug swap. I'm stopping by from Heatherly Loves Mug Swap today. Wow! I love the creativity people put into their swaps. It definitely has given me some ideas. I hope you and yours has a Merry Christmas!